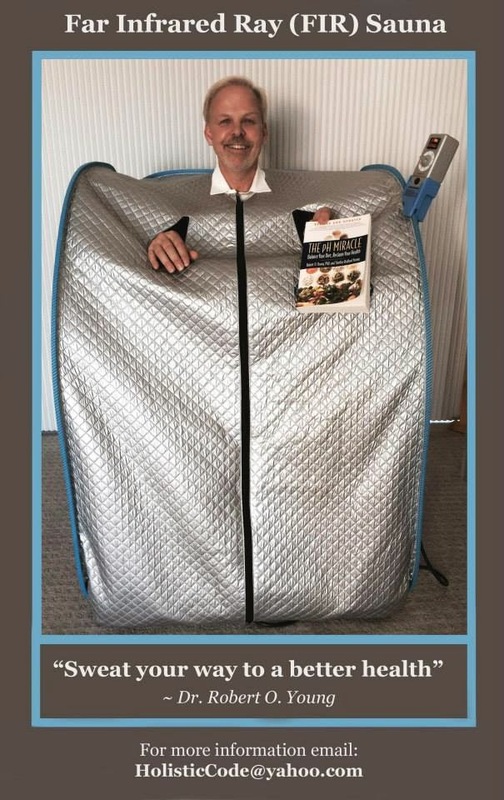 Real Portable Infrared Sauna heats up immediately and is 99% efficient. The sun emits many kinds of natural light, only some of which are visible. Infrared light has a longer wavelength than the visible spectrum and thus cannot be seen by the naked eye. The pH Miracle Portable Far Infrared Ray Sauna (FIR)If you are looking for the most advanced Far Infrared Technology, then you are Here! We may not be made out of pretty wood, but what makes a FIR Sauna so effective is the generator of the FIR Light that interacts and pulsates your water molecules, creating an increase in core temperature, an increase in circulation, and an increase in lymph flow. If you have all these, then it is incredible to see the health benefits a person can derive. Many health problems simply disappear! 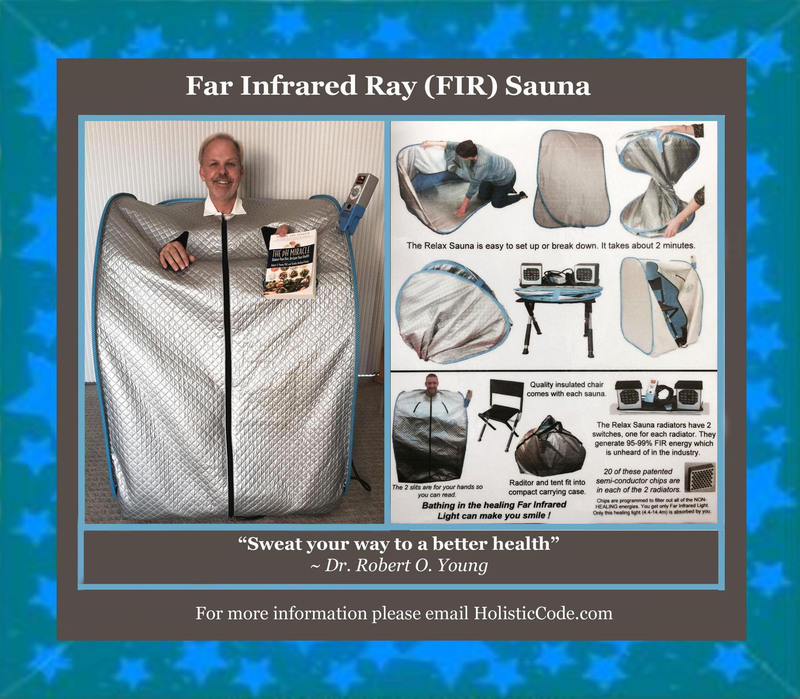 This FIR Sauna is the ONLY portable model that uses the same technology as the Sky Eye Radiator which is certified by the FDA to be a medical device. People love the Relax Sauna because it generates WARM HEALING LIGHT. And it does this very efficiently in only 15-20 minutes! The FIR Sauna radiator is the most advanced of any FIR Light generator, and generates the purest, cleanest, most intense soothing light of any FIR Sauna that we have encountered. The Sit-Up version of the Relax Sauna uses 1500 watts of energy, and generates a very intense healing light energy. The Lie-down Relax Sauna has one radiator producing 1000 watts of energy. Both have computer-programmed ceramic semi-conductor chips that filters out all NON-healing energies and a reflecting tent that penetrates deep into human tissues over and over and over again. The Sauna will NEVER burn the skin. However, the FIR heat will open the pores in the skin and provoke the body to sweat out waste and toxins. The 2 patented FIR Radiators (pictured above) have fans in them. The electric current sends Far infrared Ray energy light out from the semi-conductor chips. The purpose of the Fans are to keep the 40 Patented Semi-conductor chips cool. Because of this, the emitting of the healing FIR energy rays are continuous. This is why the relax sauna generally works in about 1/2 the time of other FIR Saunas. Because of the reflecting nature of the material that the Sauna is made out of, the Far Infrared Rays are able to circulate throughout the Sauna, allowing every part of the body to absorb the therapeutic light. The Patented Automatic Heat Controlled Ceramic Semiconductor combines heat materials, FIR Materials, and a control component. The research principle on this is: Ceramics do not conduct electricity! By changing the atomic structure, the material which will radiate the Far Infrared Rays after absorbing energy is then added. It was then confirmed by top scientists that the wavelength is between 4 um and 14 um which is suitable (and reported to be very beneficial) for our bodies. The device that can automatically control the temperature (for the user’s safety) was then added. This device allows the ceramic semiconductor chip to lower the electric current when the heat is too high, and to increase the electric current when the heat is too low. Thus the heat is kept at a steady temperature at all times. The mirror-like surface of the Sauna tent reflects the far infrared LIGHT back over and over and over again – thus creating an EVEN distribution of the Far infrared Light in the tent, whereby you are absorbing the light from every nook and cranny of the tent. In other saunas, you only absorb the light from the source of far infrared light, and thus only about 1/2 to 2/3 of you gets the benefit of the far infrared light. The Sauna whirl is symbolic of the EVEN DISTRIBUTION of Far Infrared Light. A fourth level of FIR Technology (the ceramic (computer programmed) semi conductor chip) filters out all of the non-healing energies, so you do not have to contend with anything but the absorbable far infrared light of 4 – 14 microns. Far Infrared Ray is a form of electromagnetic light energy from the sun. It falls within the same family of the Infrared Ray in the light spectrum, but due to its longer wavelengths, FIR cannot be seen by human eyes – just like ultraviolet rays and X-rays. This energy is absolutely essential for human beings and all living things in the world. Only Far Infrared waves between 4 and 14 microns can be absorbed by the human body. Near Infrared or Medium Infrared light is resisted by the body. Its wavelengths are NOT in harmony with human energy. Ultra Violet energy is much stronger than near infrared, and because of this, when our body resists this energy, it causes Friction. As a result of this intense friction caused by the body’s inability to absorb this light, the skin will tan and burn after a certain amount of time and exposure. FIR has the ability to penetrate, refract, radiate and reflect. The human body can absorb FIR because of its deep penetrating ability. When FIR penetrates through skin to the subcutaneous tissues, it transforms from light energy into heat energy. The thermal effect within the deep layers of the tissues causes bloods vessels and capillaries to dilate, promoting better blood circulation and thus better healing opportunity as oxygen is more efficiently transported to the cells of the body. Additionally, the heat produced helps to get rid of body toxins and metabolic waste through sweating. This is the Sauna Dual Radiator Controller which comes on the latest model allowing you to reduce the level of heat if you prefer. Recent research suggests that spending 15 minutes in the Relax Sauna is as good (or better) than a 45 minute cardiovascular workout, in terms of burning calories. • Produces even energy in the sauna. • For relaxation & improving one’s mood. • Revolutionary ceramic semiconductor Technology – only one in the world! Ceramic, as we know it, used to make rice bowls or pots – does not conduct electricity. However, with some modifications (by adding or removing an electron from its molecular structure) equilibrium is removed and a semiconductor is formed. When electricity passes through the ceramic semiconductor, a large resistance causes flow voltage to decrease, transforming electrical energy into heat. Ceramic semiconductor resistance is similar to what happens when a speeding car is abruptly stopped, resulting in the friction between the tires and the road’s surface to produce heat. Another example would be the light bulb, where electrical resistance in the filament is transformed into light and heat. Other FIR ceramic radiators DO NOT have this semi-conductor chip, and hence do NOT generate FIR light at high temps. History can attest to the benefits of Far Infrared Ray (FIR) Energy. The Japanese, renowned for their longevity, are equally known for their passion for taking hot spring baths. In ancient Japan, during times of war, injured warriors often took hot spring baths after battles to help heal wounds. Scientific research has confirmed the presence of many minerals in hot springs. After absorbing radiant energy from the earth, hot spring minerals transport and transform this energy into a form that is compatible with the human body. This energy (FIR) at 4-14 microns helps activate cellular renewal, stimulate blood circulation and promote healing. The semi-conductor chip converts electrical energy to absorbable FIR energy between 4-14 microns (at temperatures up to 140 – 170 degrees), excluding both near and medium infrared rays which can be harmful to the body. Hundreds of other “FIR” Saunas made in China use a hot plate and a black cloth impregnated with charcoal/carbon, which generates only about 20% FIR energy. Vital Energy for Healthy Living Jogging and swimming are good exercises, which can improve sweat gland function. Qigong is an ancient martial and healing art the Chinese practice to maintain good health. Like FIR, it promotes microcirculation in the body. The FIR Sauna device is ideal for busy people as it takes only fifteen minutes every day to obtain the same microcirculation benefits gained by jogging or practicing Qigong. The pH Miracle Sauna Tent is made out of a woven fiber, with silver embedded in this cloth. (It is a cloth, NOT plastic. You can see the weave as you can in cotton sheets.) This gives the cloth a reflecting (mirror-like) quality. With the powerful Warm FIR energy emitted by the semi-conductor chips, and the constant reflecting of this light from every nook and cranny of the tent, energy is easily absorbed and internalized by the body. The energy generated by the pH Miracle Sauna radiator has been documented by the FDA to be between 4-14 microns at temperatures up to 140-170 degrees. (FDA K510 number: K053376), and is a medical device. This is uniquely compatible with human energy, and is easily absorbed by the human body. The skin will not burn even after staying in the Sauna for long periods of time. Through the resonance and absorption by water molecules, protein, and organic molecules, the body is able to widely conduct FIR Energy which is a powerful energy source is needed to reach the depths of the body because FIR needs to be communicated through the billions of aligned water molecules. The pH Miracle Energy Sauna is designed with an output of 1500W to deeply activate all 6trillion cells in human body. When FIR energy is powerful enough, the body can healthily absorb healing FIR. When energy is insufficient, energy cannot reach the depths of our body. When the FIR energy is powerful enough, it can be transmitted into the deeper parts of the body. The continuous supply of far infrared energy in the Life Energy Sauna can narrow the molecular angle and reduce the size of water molecules (clusters). Resonant absorption by the body’s water molecules, protein, and organic molecules re-harmonizes them, which fully energizes the body’s internal molecules and helps dilate blood vessels. Given that blood vessels are now dilated and water molecules (clusters) in the body are also reduced to a healthier active size, blood circulation is much smoother. When blood vessels are unblocked, blood pressure will not increase. Blood vessels now have better elasticity. Thus, FIR supports prevention of vascular sclerosis (hardening of blood vessels). Incidence of cardiovascular disease(s) will thus also decrease. Once blood flow is smooth, it can flow throughout the blood capillaries of the whole body effectively and ensure a sufficient supply of nutrition; our metabolic rate will also healthily increase. Muscles and skin regain elasticity and maintain the suppleness of youth. The elderly often suffer from poor blood circulation and other chronic diseases because nutrients and oxygen cannot effectively be delivered to their cells. This prevents toxins from being eliminated, which in turn, speeds up the cellular aging process. If toxins accumulate inside the body for long periods, the subcutaneous vessels shrink with resulting poor absorption of nutrients, This results in the blockage of pores and the skin loses its elasticity. Perspiration can help detoxify the body which is another healthy benefit of enjoying the pH Miracle FIR Sauna. Conventional saunas on the market may be beneficial but are very pricey while cheaper alternatives do not bring good results. The FIR Sauna however is superior in its competitive pricing and delivers superb health-promoting results. FIR Energy reduces the size of water molecules and helps dilate blood vessels and increases blood flow. When large molecules flow within small blood vessels, they slow blood circulation and increase the blockage of vessels. The pH Miracle Far Infrared Ray Sauna is useful in slowing down the aging process; helps users lose weight and healthy function of the skin. FIR absorption promotes elimination of body toxins and helps eliminate chronic illnesses. The pH Miracle FIR Sauna also improves capillary circulation, and removes excess toxins from the body thereby reducing the burden on the kidneys, helping to prevent kidney failure. The pH Miracle FIR Sauna is excellent for increasing blood circulation to the skin, which is essential for beautiful, youthful, glowing skin. The result is a new “inner glow” as the skin becomes free of accumulated dirt and dry skin cells; FIR promotes deep cleansing of impurities. FIR promotes healing of acne, eczema, psoriasis, burns, skin lesions and cuts. Open wounds heal more rapidly with reduced scarring. FIR firms the skin, improving tone, texture and elasticity. Cellulite is a gel-like substance made up of fat, water and waste, which becomes trapped in pockets below the skin. The pH Miracle FIR Sauna supports cellulite elimination, as profuse sweating and cellular activation together clear away this unwanted form of debris from the body. In Europe and Scandinavia, women have used saunas for hundreds of years to prevent and eliminate these difficult to reduce spots. Due to a deeper heat penetration into cellulite, combined with more effective heating in these tissues, FIR Relax Sauna is significantly more effective than conventional saunas. The ideal pH for body fluid, which is 7.365, which is slightly alkaline. Why does the human body’s PH change from alkaline (during childhood) to acidity (in adulthood)? This is because acids are not completely discharged from our system. The pH Miracle FIR Sauna can help to discharge the body’s toxins and acids through our skin pores. FIR Sauna helps cleanse the body’s systems and promote vibrant health. Discharge of lactic acid through profuse sweating helps relax muscles. Lactic acid is one of the causes of fatigue and aging of tissues. Sauna delivers benefits of regular physical exercise without production of lactic acid and additionally rids the tissues of lactic acid accumulation in the body. Accumulation of lactic acid over time results in chronic fatigue. Regular use of the pH Miracle FIR Sauna promotes elimination of lactic acids, prevents their accumulation and thus also prevents premature degeneration of muscle tissues. Gravitational force and water retention in the body cause muscle mass and organs to become slack and the skin to lose its elasticity. This causes poor blood circulation and excessive fat accumulation, especially the swelling around the waist, belly and eyelids. The pH Miracle FIR Sauna can help to discharge excessive water in the body and is a very healthful tool for maintaining firmness and body shape. In Guyton’s Textbook of Medical Physiology, we find that producing one gram of sweat requires 0.568 kcal. The Journal of the American Medical Association (JAMA) states, “A moderately conditioned person can easily sweat off 500 grams in a sauna, consuming nearly 300kcal, which is equivalent to running 2~3 miles. A heat conditioned person can sweat off 600~800 kcal with no adverse effects. While the weight of the loss can be regained by drinking water, the calories consumed will not be.” The pH Miracle FIR Sauna helps generate two or three times the sweat produced in a conventional sauna, so the implications for increased caloric consumption are quite impressive. The FIR Sauna can thus play a pivotal role in both weight control and cardiovascular conditioning. This can be very valuable for those who don’t exercise enough and for those who can’t exercise yet want an effective weight control and fitness maintenance program which provides the caloric burn, detoxification, metabolic improvement, and especially the energetic body fluid activation benefits of regular exercise. There is of course no substitute for regular exercise to maintain health in body and mind. FIR fully supports exercise, yet provides similar benefits for the body’s energetic function. The FIR Sauna reduces body fat. Consumes calories and burns fat in just 15 minutes. A sedentary life style, overeating and lack of physical exercise are identified as causative factors in obesity, diabetes, heart disease, hypertension and danger of stroke. In many developed countries obesity and generally being overweight are among the top five enemies to good health and are responsible for about 55 percent of deaths, according to the World Health Organization. On the other hand, more and more people in the developing world (such as India, China and Brazil) are suffering from obesity and related chronic diseases, which were once associated mainly with the rich and developed world just a few decades ago. Increased urbanization, sudden changes in diet combined with a more sedentary life style, play a large part in this shift towards obesity, as pointed out in the WHO Expert Report 2003. Obesity can cause, among other things, coronary heart disease, diabetes, certain forms of cancer, and arthritis. The pH Miracle FIR Sauna can play a pivotal role in disease prevention and in health maintenance by activating the body to relieve degenerative disease and to avoid the fall into chronic disease. Toxic substances accumulate in our body due to free radicals. Examples include insecticides (used on fruits and vegetables), antibiotics (in poultry and other farm animals) and antiseptics (used on other foods) and many other chemicals we use in daily life. The best way to prevent abnormal cell growth is to detoxify through perspiration. The human body has a powerful self-healing ability. But its self-healing ability is dependent on healthy cellular function combined with sufficient nutrition and effective detoxification. FIR energy improves blood circulation and efficient nutrient and oxygen delivery. FIR thus promotes cell growth and cell reactivation, overcoming and preventing growth of abnormal cells, and supports good cellular maintenance. Viscous blood, caused by excessive blood glucose, slows down blood flow, increases blood pressure and prevents the absorption of nutrients by the body’s cells. Over the long term, viscous blood can cause eye complications, kidney problems, heart diseases and stroke. Studies have shown that regular exercise lowers blood sugar by speeding the transport of glucose in the cells and so exercise is considered an “invisible insulin”. Regular exercise makes cells more receptive to glucose and decreases the sugar circulating in our blood stream. The pH Miracle FIR Sauna therapy is excellent for promoting the burning of calories which helps improve cardiovascular conditioning. Furthermore, FIR Sauna provides FIR energy, which helps reduce the size of water molecule clusters and decreases the possibility of blood coagulation; thus blood flow is smooth. Long-term usage can help to reduce the problems of viscous blood. Reduction of Uric Acid through sweat gout is a very painful inflammatory arthritis caused by uric acid crystals forming in the joints. Supersaturated uric acid in the urine can crystallize to form kidney stones that may then block the tubes that lead from the kidneys to the bladder. Heavy uric acids can gradually build up in body tissues, leading to gout. Using the pH Miracle FIR Sauna may help relieve gout. It is believed that urea and uric acid can be released most readily and frequently through sweating. It is apparent that the FIR Sauna can most easily, conveniently and efficiently help the human body to release surplus uric acid without producing uric acid (as is the case in prolonged exercise), and thus unlike exercise, does not place an extra burden on the kidneys. It is suggested that when using the pH Miracle FIR Energy Sauna, it is best in advance to drink a copious amount of water and eat alkaline food (green vegetables, sprouts and low sugar fruits). This approach is most helpful for those who suffer from having excess uric acid in their system (as occurs in gout). Organs and blood vessels will degenerate if they are not actively functioning. The pH Miracle FIR Sauna increases blood flow and dilates blood vessels. It also helps retain the elasticity of blood vessels and helps them to “exercise”. When blood flow increases, waste, cholesterol and fat etc, are removed from the walls of blood vessels. Once these cumulative materials are removed, blood capillaries in the brain cease to be blocked and apoplexy can be prevented. The dilation or exercising of blood vessels can help prevent their degeneration. In cold climates, the blood vessels shrink and become smaller in diameter in order to keep the internal organs warm. Due to the regular demand of blood flow by the body, blood pressure must go up to maintain this flow. And this might lead to a breakdown of the blood vessels, causing hemorrhaging (thereby leading to apoplexy). Exercise can induce the blood current to move faster and dilate the blood vessels as well as increase the elasticity of vessels. But most people lack the time and patience to exercise every day. Occasional exercise is not fully effective because the training and improving of elasticity of the blood vessels needs daily maintenance. The pH Miracle FIR Sauna produces FIR energy which goes deep into our body, to the depths of the bone marrow. People with conditions such as heart diseases and high blood pressure show marked improvement after using the pH Miracle FIR Sauna because FIR energy helps dilate their blood vessels and increase blood flow thereby unblocking and eliminating waste in the blood vessels. The opening of pores during perspiration also helps eliminate waste, toxins and fat inside the blood vessels. The pH Miracle FIR Sauna is easy and convenient to use. It is a “waterless” hot spring. The even distribution of energy ensures maximum benefits. Enjoy the comforts of a hot spring dip at home today!